The most enduring myth about the Abstract Expressionists is that they were dumb geniuses, instinctual beings, know-nothings who somehow stumbled into poetry when they picked up a paintbrush. The artists themselves played a not inconsiderable role in promulgating this myth. Rothko, Pollock, and de Kooning each wanted to be regarded as sui generis, a one-man movement. They wanted it understood that although they had studied the teachings of Kandinsky and Mondrian and any number of other European giants, they rejected those world-historical visions. They wanted their painterly magic to have a pragmatic, nuts-and-bolts, matter-of-fact impact. No wonder their hyper-verbal contemporary, the critic Harold Rosenberg, described them as Coonskins, all-American guerilla fighters, with a wily, unconventional, seat-of-the-pants way of battling the Redcoats, their overly thoughtful and theoretically oriented European precursors. Everybody has always known that this to-hell-with-ideas-and-theory talk contained a strong dose of fakery, or perhaps wish fulfillment. After all, it was the artists themselves who dreamed up the Artists’ Club, where they got together on a regular basis and talked a blue streak. And there were quite a few little magazines devoted to artists’ writings, such as Tiger’s Eye, Possibilities, and It Is, and nearly everybody contributed. The surprise of more recent years has been in discovering not that the artists actually wrote, but that they wrote an enormous amount. What once looked like a trickle has begun to suggest a torrent. The Extreme of the Middle: Writings of Jack Tworkov and The Journals of Grace Hartigan: 1951-1955 are only the newest additions to what is turning out to be a long shelf of books that complicates and enriches our sense of those times. 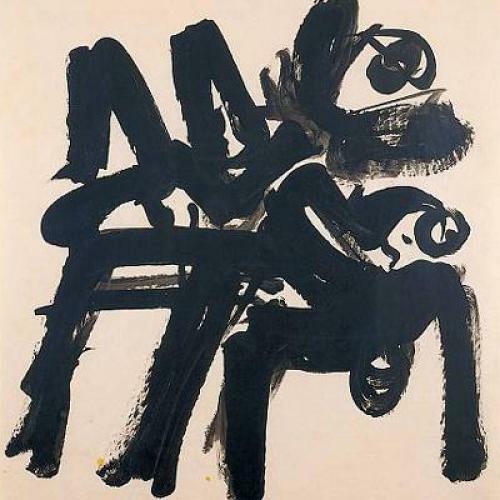 Hans Hofmann’s writings were collected already in the 1940s, and the past generation has brought collections of prose by Reinhardt, Motherwell, Newman, and de Kooning. A surprise of the past few years has been the appearance of Mark Rothko’s writings, which take up two volumes, including what amounts to a treatise on painting called The Artist’s Reality, written in the early 1940s and never before published. Fairfield Porter is now represented by volumes not only of criticism but also of letters and of poetry. There is a volume of Elaine de Kooning’s writings. And there is more to come, including the journals of the painter Mercedes Matter, a close friend of Hofmann, Pollock, and Lee Krasner. Neither Tworkov nor Hartigan has ever been an artist I particularly admire. Even Tworkov’s strongest abstractions can feel like footnotes to de Kooning and Guston. And Hartigan’s painterly representational style generally lacks the focus and confidence I associate with some of her contemporaries, such as Nell Blaine and Leland Bell. Reading their journals, however, brings a heightened sense—even a thrilling sense--of their place in the period. I admire their forthrightness. It is clarifying to read the takedowns of Clement Greenberg by Tworkov and Hartigan, who remind us of the healthy skepticism with which his imperious statements were often received. “The influence of Greenberg’s criticism,” Tworkov writes in 1959, “hurts the position of every artist who believes in painting, who believes that a work of art is something lived thru and not merely perpetrated.” Greenberg, Tworkov insists, is only interested in artists who “stand for the abolition of the experience of the soul, of the psyche, which has always been the genius of any work of art. He stands for blind chance, for no-art.” And Hartigan calls Greenberg “irresponsible” and comments that “Clem is a bitter man, tragic.” These books give a startlingly immediate sense of all the local infighting and backbiting, as when Greenberg is quoted by Hartigan saying of Alfred Barr, the brilliant director of the Museum of Modern Art, that “everyone knows Barr is a fool and knows nothing about art.” The journals pack a novelistic punch. Hartigan’s Journals have some of the freshness and immediacy that for generations has drawn readers to the diaries of the painter Marie Bashkirtseff, who died in Paris at the age of twenty-five in 1884. I only wish that the book were better edited; when Tworkov is mentioned, it is as “Twarkov,” an error perhaps in Hartigan’s manuscript that should have been corrected. But these are relatively minor matters. What emerges is a complex portrait of a woman in the New York art world in the 1950s, a time and a place when, so we have all too often been told, women were little more than helpmates and accessories. Hartigan was anything but a victim. She was closer to a victor. Certainly she was a rising star, exhibiting at the Tibor de Nagy Gallery, albeit initially as George Hartigan, apparently less a subterfuge than a gesture that mingled a salute to George Eliot and George Sand with an element of “high camp” disguise, common among the poets who were her friends. The Journals are a record of passions and enthusiasms—for friends and lovers, but even more than that for all the arts, for the paintings of Rubens and Lovis Corinth, the poetry of Rilke, the writings of Woolf, and the music of Ravel. You feel Hartigan plunging into a culture that she values for its crazy quilt richness. And she doesn’t back away when her own work takes an unpredictable turn: her paintings strike even her as strange, bizarre, certainly nothing like the abstractions of de Kooning or Pollock. “I’m confused about what I want in my work now, I must be even more ambitious,” she writes in 1953. Later that year, she records a comment by Joan Mitchell, who “admired my courage in making ugly pictures. I’m always hurt when anyone thinks my pictures are ugly, I make them as beautiful as I can.” The keynote of Hartigan’s writing is this mingling of forthrightness and abashedness, of determination and doubt. There is a particularly Manhattan rhythm to these accounts of mid-century days and nights, a dialectic that is fueled by the back-and-forth between solitary hours in the studio and heated conversations at openings, on street corners, over dinners and drinks that last into the wee hours. In brief comments, first published in 1959 in the magazine It Is, Tworkov wrote about “the enthusiastic clash of ideas that takes place in the [Artists’] Club.” And that clash of ideas—and emotions, doubts, ambitions, avidities—comes through very strongly in these writings. In February 1959, Tworkov had dinner with Mary McCarthy and a number of other people. “Mary,” he writes, “is used to turn on her full charm with great competence it is easy to see. She too holds artists ought not to write, that they are inarticulate as she said, ‘Artists can only point.’” Nothing could be further from the truth. After you have read a few pages by Jack Tworkov or Grace Hartigan, there will be no doubt in your mind that painters are among the most articulate people on earth.